In the shadow of the world’s tallest peak Mount Everest, like minded alpinists with summit fever gather and prepare for their perilous ascent. Start in Kathmandu, Nepal, and embark on an unforgettable trek of your own through Sagarmatha National Park. Reach Mount Everest Base Camp amid one the most humbling landscapes the world can offer. This honeymoon can be enjoyed by active couples as the hike to Everest’s base camp is a challenge on its own with an elevation of 17,590 feet. Along the way, you’ll encounter a multitude of monasteries and stupas, Sherpa villages and spiritual Buddhist traditions to discover. A wide variety of companies offer guided tour packages which include everything from flights and meals to camping gear, etc. for minimal fuss and organization on your end. Alternatively, local guides or porters can be hired to help with your own preparations if getting ready for an adventure is your thing. Regardless of your preferences, it is wise to conduct some research to be better prepared and know what to expect. Looking for a honeymoon destination where there's no shortage of adventure? Start your travels at the Everest Base Camp. It’s best to take this trip from March to May for the best weather and visibility of Everest. Avoid the monsoons season, hot summer weather and extreme cold of winter for a most comfortable, safe and pleasant experience. Hotel Shangri La: Luxury hotel located in Kathmandu, perfect for a post-trek stay. Asan Tole: A busy market in Kathmandu where produce, spices and yak tails are sold. Itum Bahal: A lovely Buddhist monastery courtyard and largest of the old city. Pashupatinath Temple: Important Hindu temple that sits on the banks of the Bagmati River. Bodnath Stupa: Nepal’s most important Buddhist stupa was built just after AD 600. Trekking: Many different options from day treks to multi day circuits are available. Hotel Everest: View This mountain lodge has panoramic views of Everest in every room. Namche Bazaar: Township on the way to Base camp, perfect to acclimatize to the altitude. 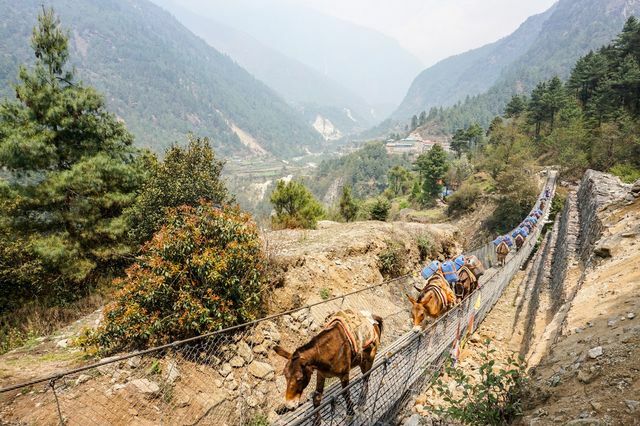 Khumjung School: Established by Sir Edmund Hillary on his expeditions, visitors welcomed. Tengboche Monastery: This sacred Buddhist monastery is set amidst magnificent mountain views. Mongla Village: Located on the hiking route to Gokyo and decked with prayer flags. Private Helicopter Charter: This activity is rather expensive, albeit grandiose and unforgettable.